The HTML <img> tag represents an image in the html document. There are two required attributes in <img> tag : src and alt. The <img> tag belongs to Flow content, phrasing content, embedded content, palpable content. 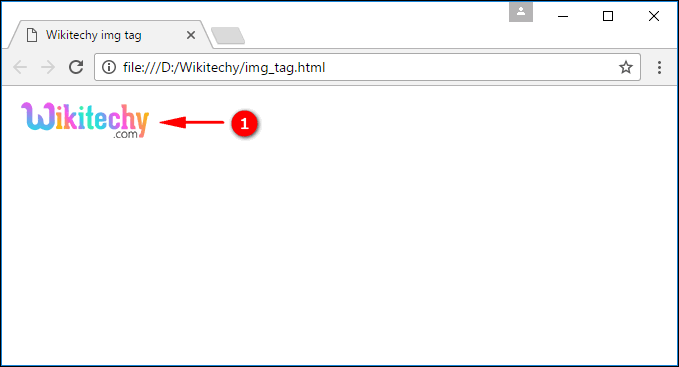 The <img> tag supports Global attribute and Event attribute. align, border, hspace and vspace attributes are supported. align, border, hspace, and vspace attributes are not supported in HTML5. <img> used to display an image into the document. src attribute used to define the location of the source image. alt attribute is used to set alternate text for the image in case the image does not displayed the alternate text will be shown. The output shows the wikitechy logo image.